I decided to travel from San Juan to visit El Yunque Rain Forest in Rio Grande, Puerto Rico. Upon arrival, I stopped at the El Portal Exhibit Hall to get maps of the area and view a multimedia display. It was sunny, but I noticed that it was raining at the top of the mountain. 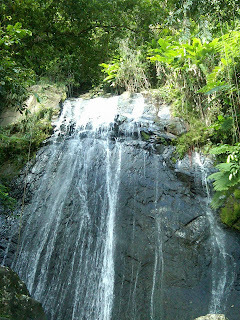 Of course, El Yunque is a rain forest, with an average of over 100 inches of rainfall a year. Even though I knew there are plenty of shelters located throughout the park, I was prepared. I took along my rain gear, water, and wore good walking shoes. 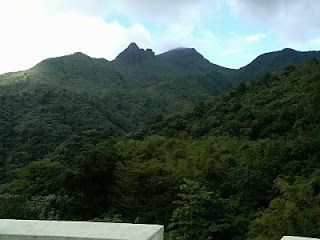 Looking at El Yunque from a distance, there appears to be a shape on the mountaintop which, according to folklore, was believed to be the deity Yuquiyu sleeping. According to legend, the good spirit "Yuquiyu" reigned on his mighty mountain-top throne, protecting the Taino people. El Yunque is part of the Luquillo mountain range and is divided into four different forests: Tabonuco, Palo Colorado, Palma Sierra and En Las Nubes, which is often shrouded in fog and a remarkably beautiful part of El Yunque Forest with its twisted, stunted trunks and giant ferns. In El Yunque Rain Forest there are 8 types of lizards, 13 types of Coquis(Puerto Rican tree frogs that sing), 50 types of birds, including the native Puerto Rican Parrot, which is an endangered species. There are 11 types of bats, the only one type of mammal natural to El Yunque. Also found, but very rare, are nonpoisonous snakes. Among them, the Puerto Rican Boa can reach a length of 90 inches. 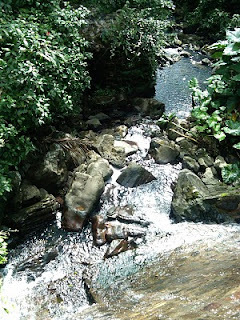 El Yunque also has abundant flora including: 240 native tree species, 23 of them found only in El Yunque, 88 rare tree species, 50 native orchids, and 150 types of ferns. I walked along the paved forest paths down to the most beautiful waterfall. On the way I could see native ferns and wild orchids, while listening to the birds and of course, the one and only Coqui. I also walked down the steps below the Palo Colorado Ranger Station to the little gazebos below, which have roofs, picnic tables and BBQ grills. I took one of the gazebos next to a calming, rushing stream and enjoyed a picnic lunch. The tranquility experienced during my visit to El Yunque Rain Forest was nourishing to my soul, and will long be remembered.